Welcome to eZee Insider, your monthly gateway into all things eZee. In this edition, eZee launches Online Feedback System – eZee iFeedback. First ever client in Marshall Islands and eZee Technosys becomes TripaAdvisor Connect Premium Partner. eZee is thrilled to announce its new product eZee iFeedback, a versatile online feedback system that will allow hotels and restaurants to connect with the customers directly. eZee iFeedback features customizable feedback forms, social media integration, advanced reports and much more, giving restaurants all the tools required to know the changing trends and moods of customers. In the hospitality industry without satisfied and happy customers, it would be impossible for hotels and restaurants to be successful and constantly grow. For a hotel and restaurant to be truly successful and to keep that success constant is matter of adapting the right trends at the right time and keeping up with the ever-changing customer expectations. For that, communication is the key and engaging customers directly is necessary in today's social media age. Given the fast-paced environment of hotels and restaurants, it can be a daunting task for management or restaurant owners to engage the customers directly. A negative comment or feedback from a customer can spread like a wild fire over the internet through social media and other outlets and restaurants are in dark while it is happening. Powered with robust features and options, eZee iFeedback will give complete freedom to establishments when it comes to how and when to engage their clients. For example, a user posts a negative feedback; the system will automatically send an alert via SMS or Email to the staff notifying them of the customer's experience. This gives the staff a chance to convert that negative feedback into a positive one before the customer leaves the premises and contain the situation before it can damage the brand. eZee iFeedback not only collects the data according to the specific requirements of the hotels and restaurants but also breaks down all the data in a comprehensive manner which is easy to understand for the management. It is an inexpensive way to know your customers, instead of paying a consultancy or someone else to come and tell you to make changes, you can directly keep in regular contact with the source that is your own customer. eZee iFeedback can help you improve your hotel and restaurant operations in real time and increase customer retention and loyalty. TripAdvisor Connect is an online platform from TripAdvisor, the world's largest travel website. It helps independent hotels and Bed & Breakfasts to access services previously only available to major online agencies, booking engines and hotel chains. eZee is pleased to announce that our booking engine eZee Reservation is one the chosen booking engines which will be part of their initial launch of TripAdvisor Connect service. The date of the service is purely speculative at this point, as TripAdvisor has mentioned it will most likely be last quarter of the year. Part of TripAdvisory Connect service, the tiered certification process for online booking engines to offer different service to their clients. TripAdvisor Connect – Hotels and B&B's can bid for TripAdvisor meta search traffic. TripAdvisor Connect Plus – Hotels and B&B's can bid for TripAdvisor meta search traffic and automate review collection efforts using TripAdvisor's Review Express service, which will be integrated into the platform. TripAdvisor Connect Premium – Hotels and B&B's can bid for traffic, automate review collection, and track the results of their activity to measure their return on investment. How can TripAdvisor Connect and eZee Reservation benefit hotels? eZee is a TripAdvisor Connect Premium means eZee Reservation has a TripConnect Premium Certification which will allow you to receive reports on return on investment (ROI) of your campaign. Hotels will receive free impressions in Holel Price Comparison search results whenever a user goes to hotel's TripAdvisor profile. Save on commission, as traveler will directly connect to your online booking engine from your TripAdvisory hotel profile page. eZee Reservation is part of 210 internet booking engines that have signed up in anticipation of the site's online platform. Hotels will be able to add booking engine link to their TripAdvisor profile that will feature rates and availability and send travelers directly to your online booking engine for direct bookings saving you on channel commission. TripAdvisor Connect provides a new way for hotel owners to directly engage ready travelers and maximize direct bookings maximizing revenues. For information on how eZee Reservation and TripAdvisor Connect, please email us on tripadvisor@ezeetechnosys.com. critical operations from front desk operations to back office accounting giving them efficiency in their operations. In addition, the hotel also boasts a Karaoke, Nightclub on the tenth floor of the hotel and a restaurant for all they have implemented eZee BurrP!. The POS is integrated with Financial Accounting Software and Loyalty/Gift Card module that will help with efficient management of their loyalty program. All of integration with seamless integration between the eZee products will provide the hotel a natural software ecosystem that will cover all the major and minor aspects of the operations. The eZee Malaysia team will be provide support during implementation and training who will be highlighting the easy to use nature of eZee products and software ecosystem. The Pub located in Majuro a large coral atoll and district of Republic of the Marshall Islands have chosen eZee BurrP! as their Point-of-Sale software. the management. The Pub is one of the most famous locations for the local and international travelers in the island. eZee looks forward for further expansion in the region and strengthen our presence worldwide. Hotel & Restaurant Association (Western India) serves the interests of the hotel and restaurant industry in the region. By becoming a member of the association, eZee plans to strengthen its relationships with the local hospitality businesses and the community. eZee FrontDesk is a state-of-the-art a desktop based property management system that enables hotels and hotel chains to run operations more efficiently and effectively. Designed and developed with the latest technology meeting international hospitality standards. 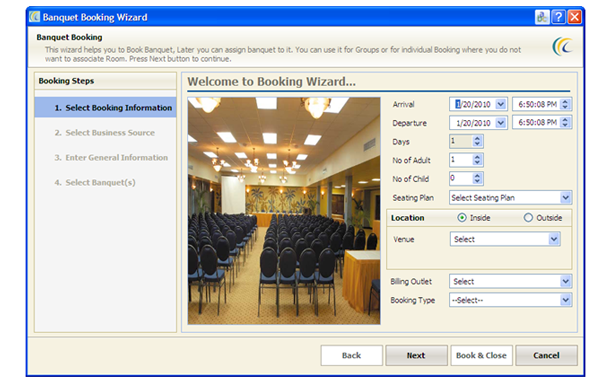 Banquet management module will enable better management of banquet bookings. Manage banquet bookings on hourly and daily basis and further options for seating arrangements, themes, and packages. Banquet revenue report shows management detail report on number of bookings, total revenues generated through events, etc. giving them a complete picture of the banquet related activities. The module will help you to manage all your booking and reservation of various conferences in your hotel. Prepare custom themes, seating plans, requirements, and any custom packages that you offer for banquets. Create custom menu card as per the requirements with items, remarks and other details. Furthermore, create detailed pro forma invoice that will include all the essential information, requirements, and package offers along with agreed terms and conditions. These are few of the many options available at your disposable with the Banquet Module for management and running successful events at your hotels. For more information on Banquet Module and what it can do for your Hotel, please visit www.ezeefrontdesk.com or email us at support@ezeetechnosys.com.